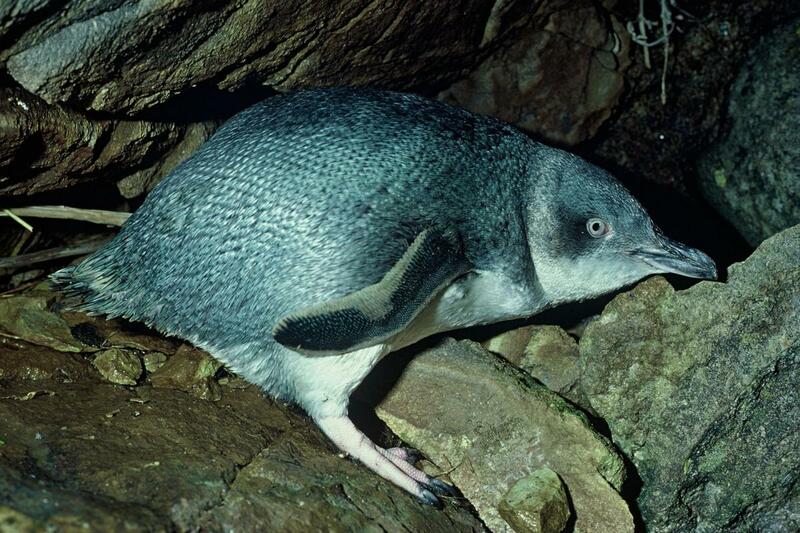 Geographical variation: No subspecies recognised, as regional morphological differences are minor, clinal, and not supported by analyses of genetic diversity. 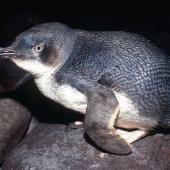 Two clades were identified using mitochondrial DNA: (1) Australian populations (formerly E.m. novaehollandiae) and some Otago birds, and (2) all remaining populations including some Otago birds. 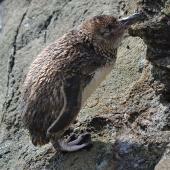 The second clade included all birds previously assigned to E.m. iredalei (northern New Zealand), E.m. variabilis (Cook Strait), E.m. albosignata (the white-flippered penguin of North Canterbury), E. minor chathamensis (Chatham Islands), and some E.m. minor (southern New Zealand). 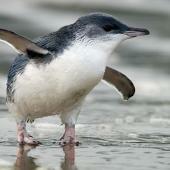 The little penguin is the smallest penguin. 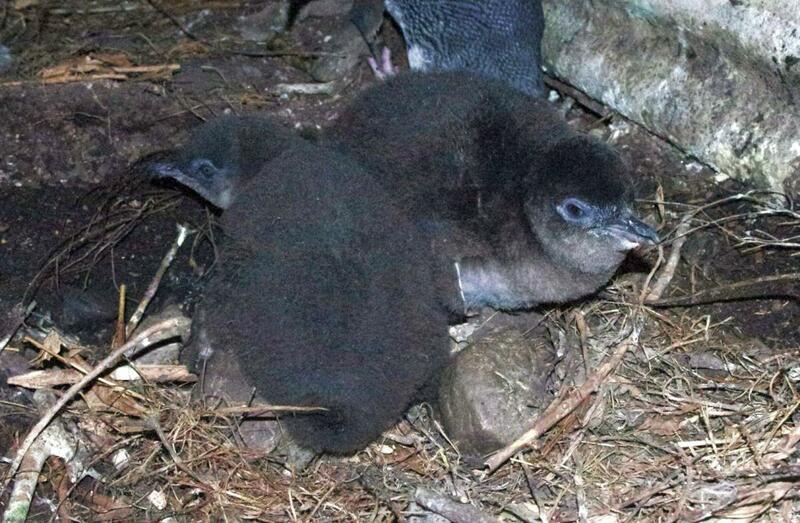 They are medium blue to dark indigo-blue dorsally, sometimes with a greenish cast, and have white underparts. 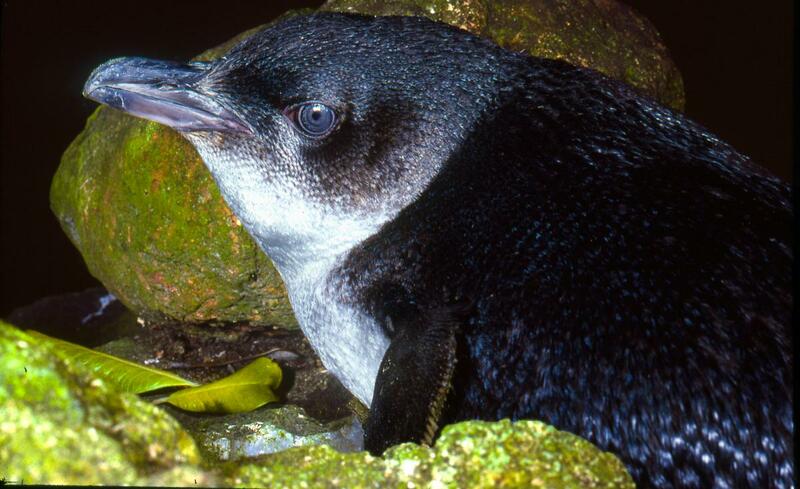 Dark slate-blue on the face extends to just below the eye. 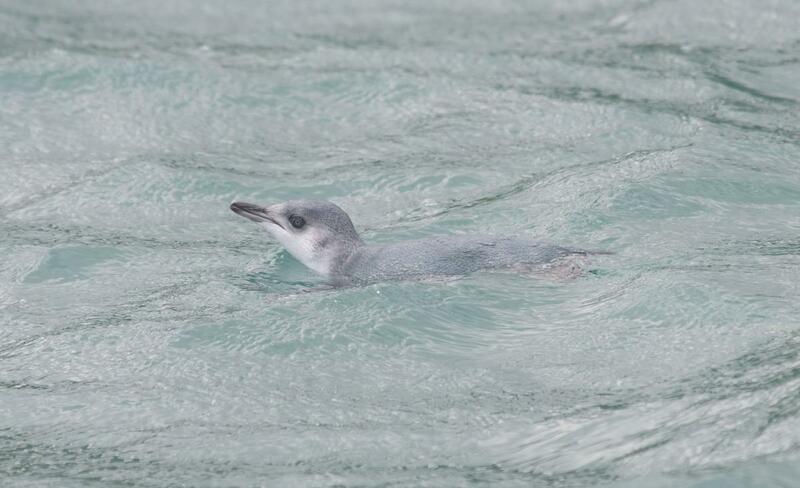 Birds from Banks Peninsula and North Canterbury are the palest dorsally, have wider white margins on the front and back edges of the dorsal surface of their flippers, and may have more white on their face and rump. 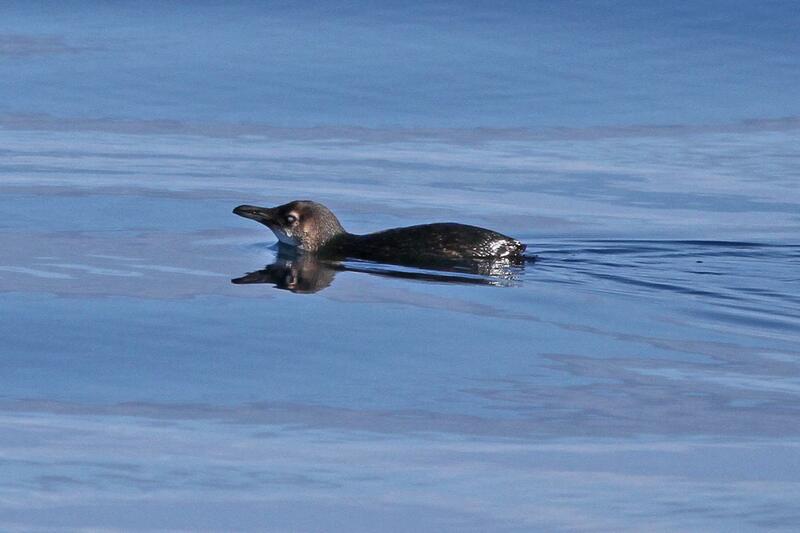 Before the annual moult, dorsal surfaces may be pale brown. 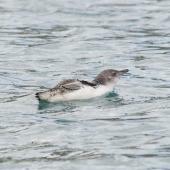 The robust, hooked bill is dark grey, the iris blue-grey or hazel, and the legs and feet are off-white with dark soles. 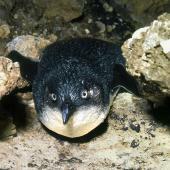 Males are slightly larger than females, with more robust bills. 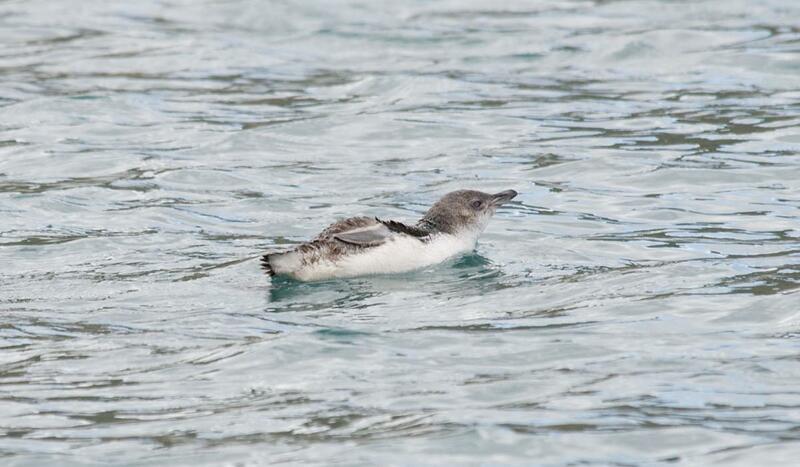 Recently fledged young are bright blue dorsally, and markedly smaller than adults. 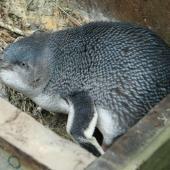 Voice: the main call at nesting sites is a loud bray ending in an inhalant squeal; also deep growls. 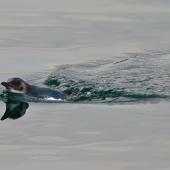 A contact ’bark’ is given at sea. 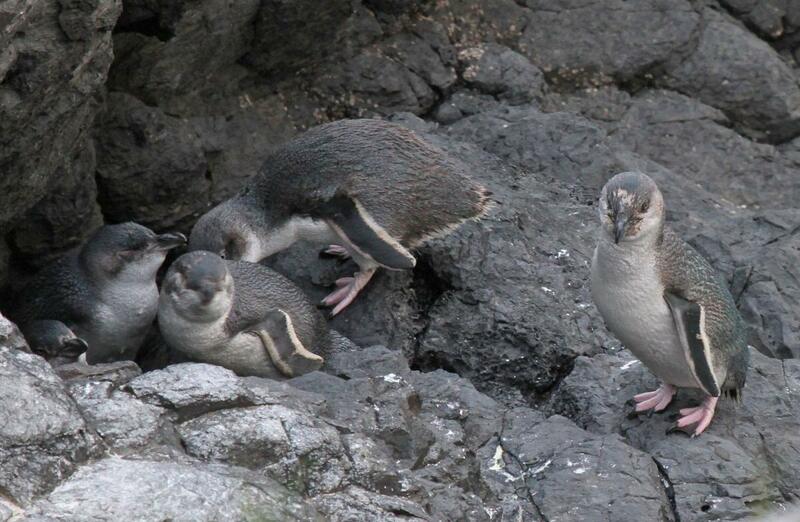 Similar species: recently-fledged crested penguins (e.g. 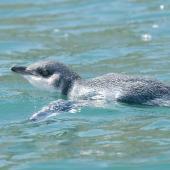 Fiordland crested penguin) are also dark-blue dorsally, have dark bills, are much smaller than adults, and have reduced crests. 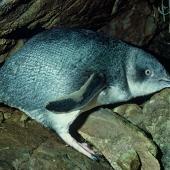 All are at least half as large again as little penguin, and have at least a trace of yellow in front of or over the eye. 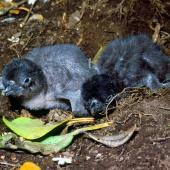 Little penguins are widely distributed along the coastlines of the North, South, Stewart and Chatham Islands and their offshore islands. 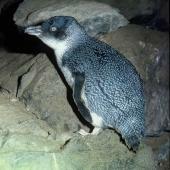 They visit (but are not known to breed at) the Three Kings Islands, and are vagrant to the Snares Islands. 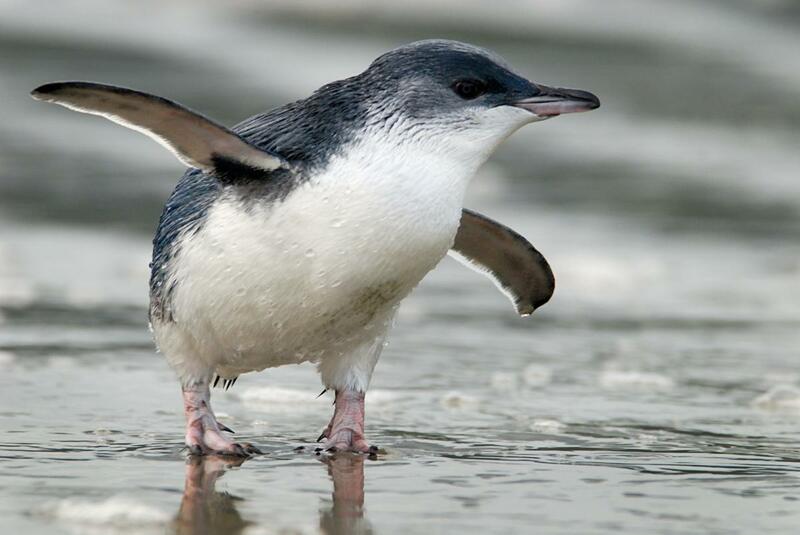 Little penguins are also common in south-western and south-eastern Australia, where they are also known as fairy penguin. 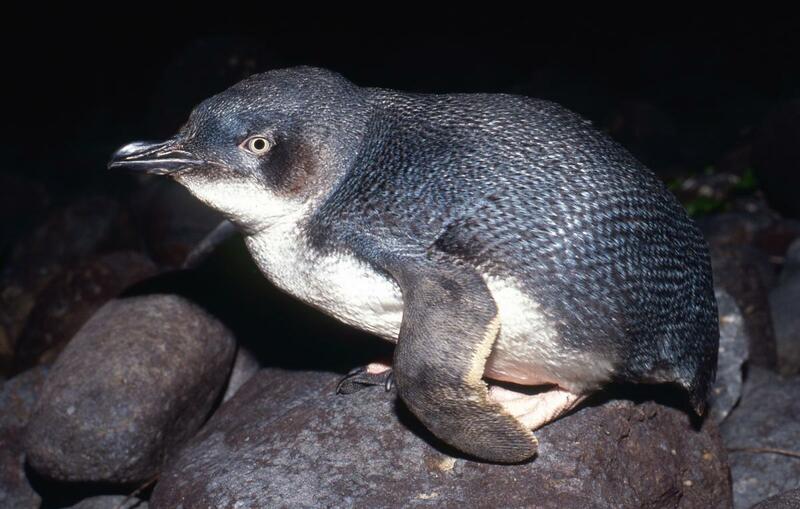 Little penguins are mainly found within 25 km of the shore during the breeding season, but can travel further out to sea when not breeding. 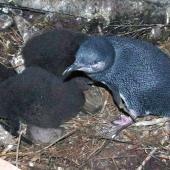 Major breeding areas in New Zealand include Hauraki Gulf islands, Wellington Harbour, Cook Strait islands and Marlborough Sounds, West Coast, Fiordland, Motunau Island, Banks Peninsula, Oamaru, Otago Peninsula, islands in Foveaux Strait and around Stewart Island, and the Chatham Islands. 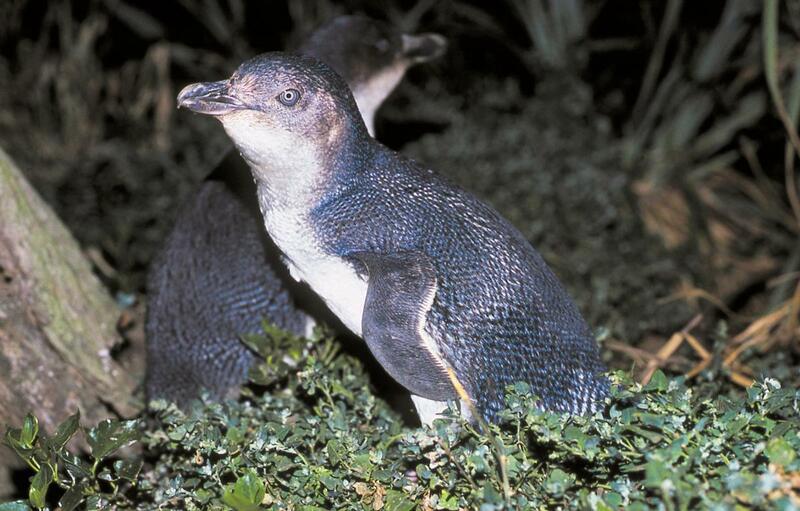 Common along most New Zealand coastlines, especially where offshore islands provide protection from predators and disturbance, or where protection measures are in place on the mainland. 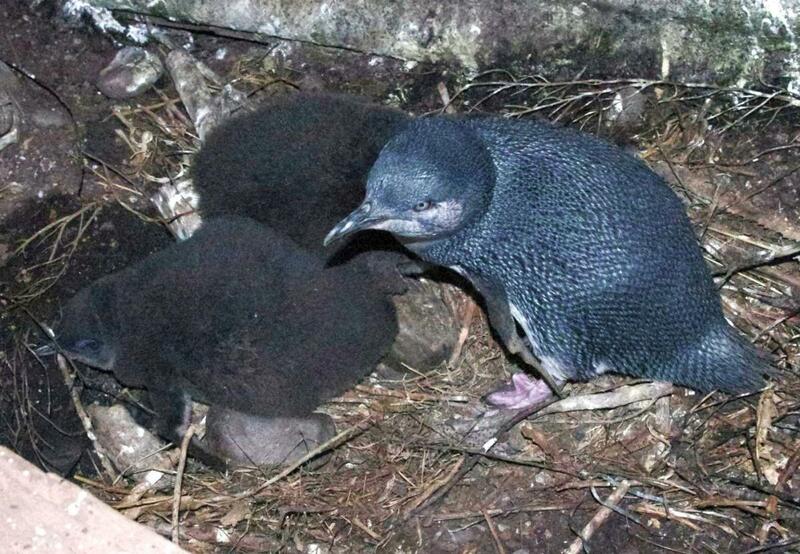 The largest colonies are on Motunau Island (1650 nests) and at the Oamaru Blue Penguin colony (>1,000 individuals). 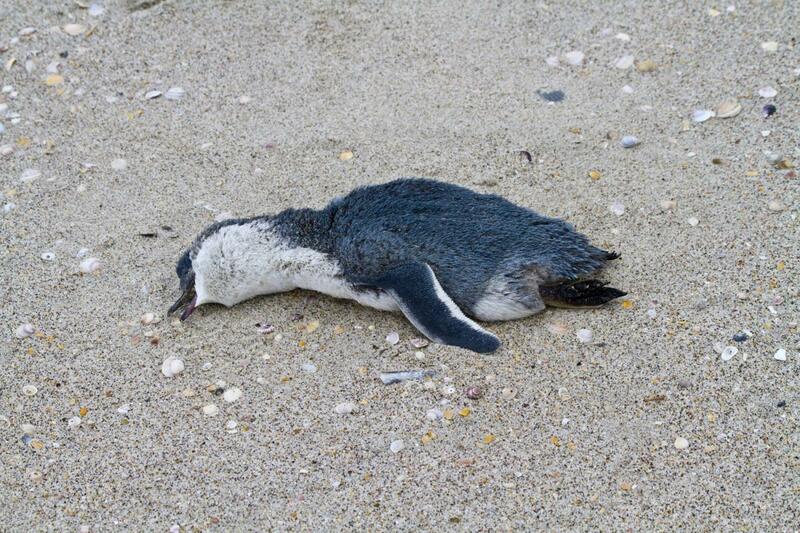 Many colonies are in decline due to predation by introduced predators including cats, dogs and ferrets. 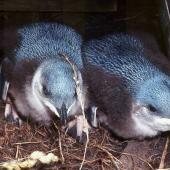 Little penguins at sea are at risk of entanglement in set nets. 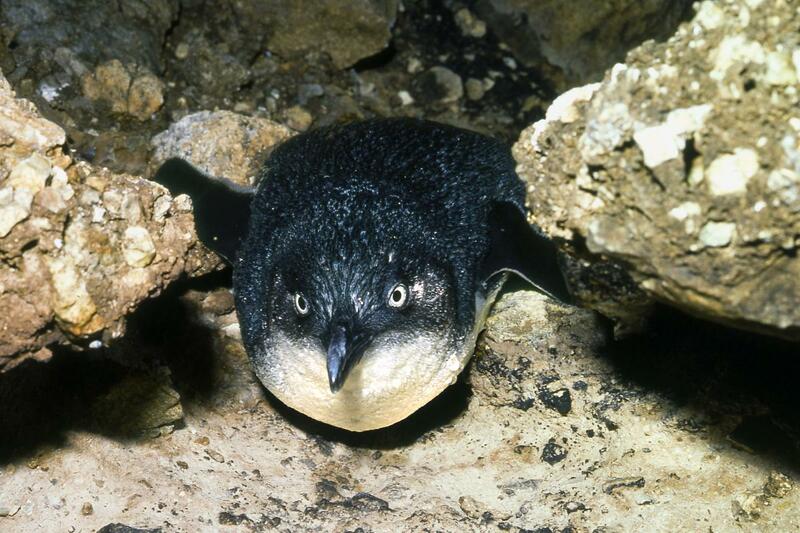 Some mainland colonies are also affected by human encroachment onto important breeding areas, and individual pairs are often physically removed or blocked out of nest sites under houses, when owners object to their loud calls and fishy odour. 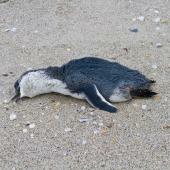 Many adult penguins are hit and killed by cars where coastal roads run between breeding areas and the sea, e.g. 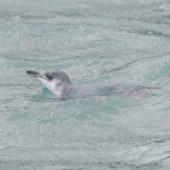 around Wellington harbour and parts of north Westland. 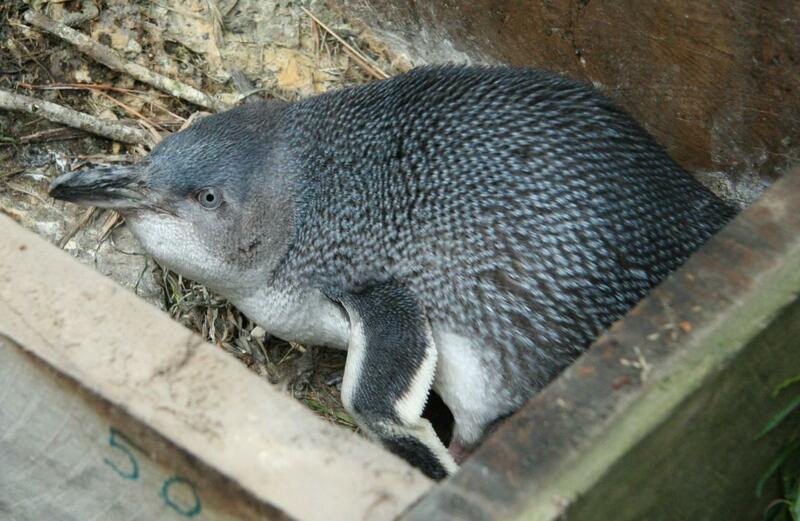 Little penguins respond well to predator control and provision of nest boxes to provide safe nesting sites, with populations around Wellington Harbour, Banks Peninsula and the Oamaru Blue Penguin Colony increasing as a result. 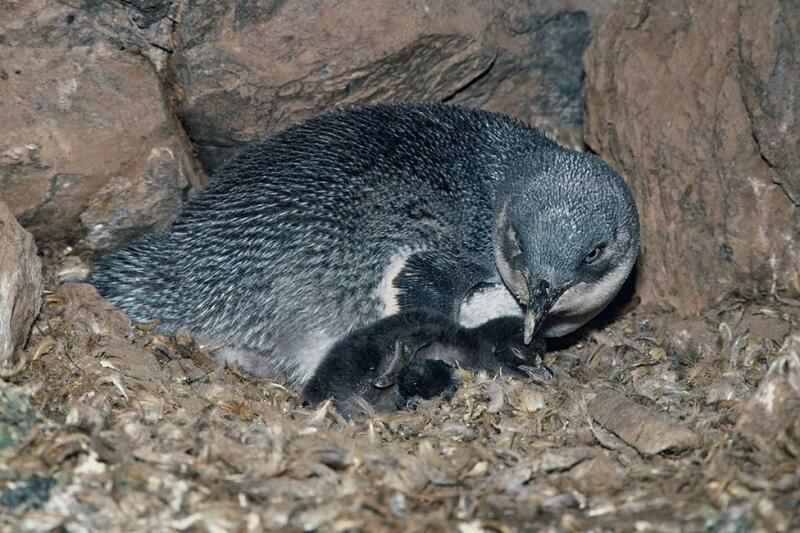 Little penguins can breed as isolated pairs, in colonies, or semi-colonially. 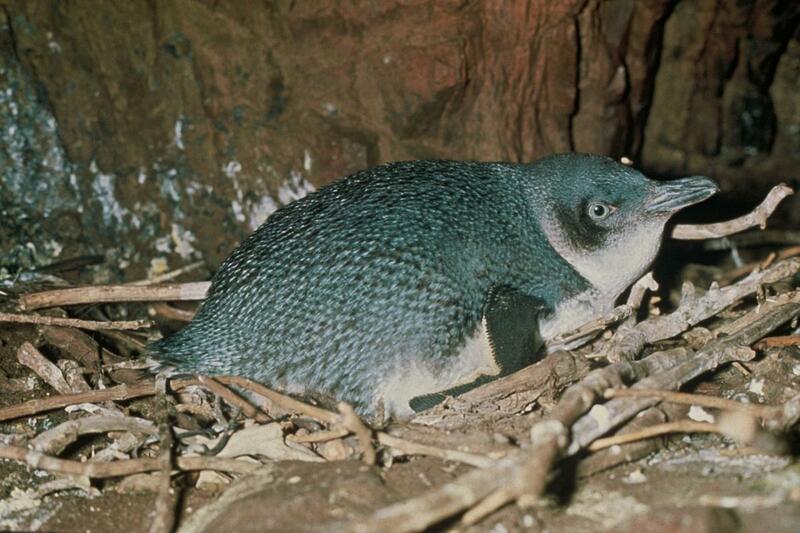 Nests are situated close to the sea in burrows excavated by the birds or other species, or in caves, rock crevices, under logs or in or under a variety of man-made structures including nest boxes, pipes, stacks of wood or timber, and buildings. 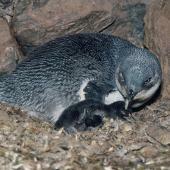 They are monogamous within a breeding season, and share incubation and chick rearing duties. 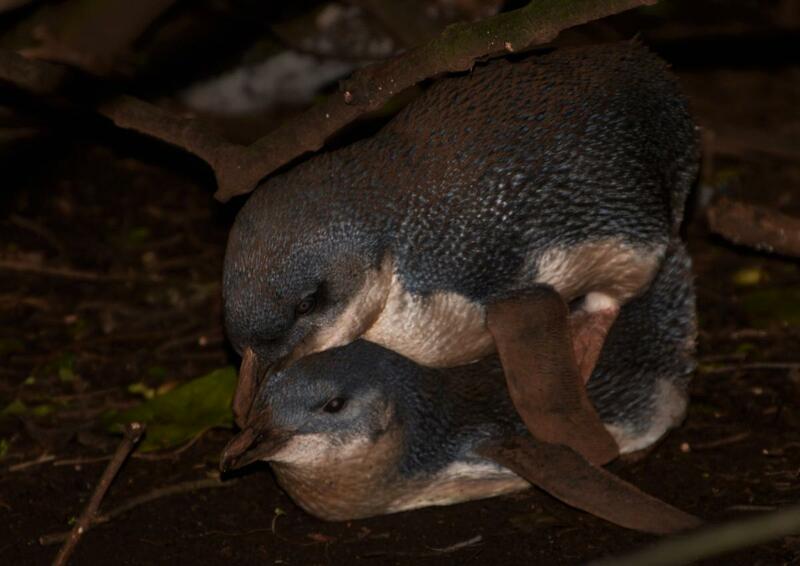 They are the only species of penguin capable of producing more than one clutch of eggs per breeding season, but few populations do so. 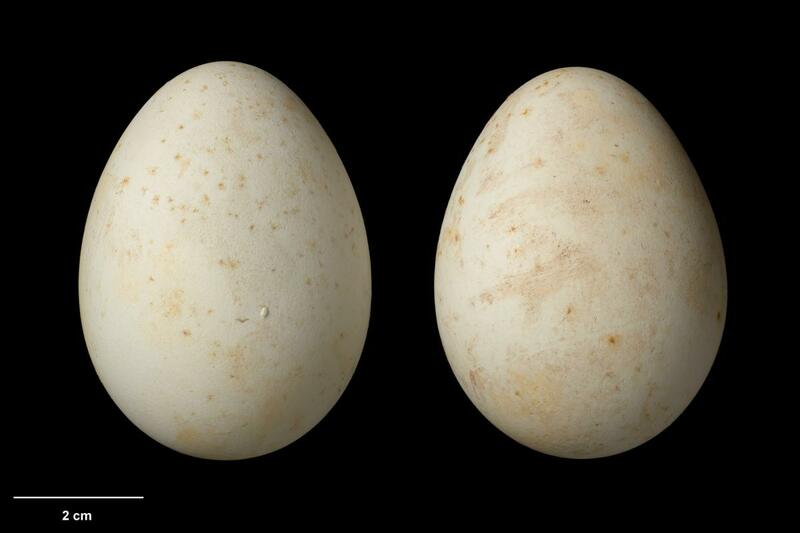 The 1-2 white or lightly mottled brown eggs are laid from July to mid-November, and with rarer second (or even third) clutches beginning as late as December. 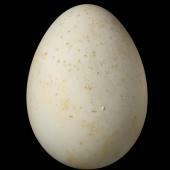 Incubation takes up to 36 days. 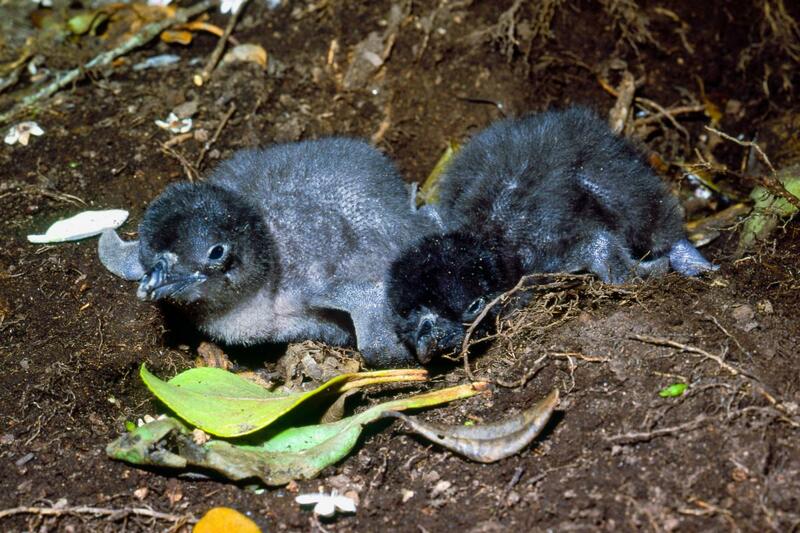 Chicks are brooded for 18-38 days, and fledge after 7-8 weeks. 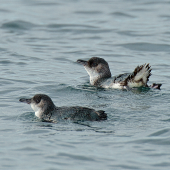 Pairs are often highly faithful to nest sites. 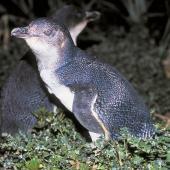 Little penguins are nocturnal on land. 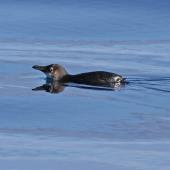 They return to nesting areas at dusk, congregating in small groups, or “rafts” offshore. 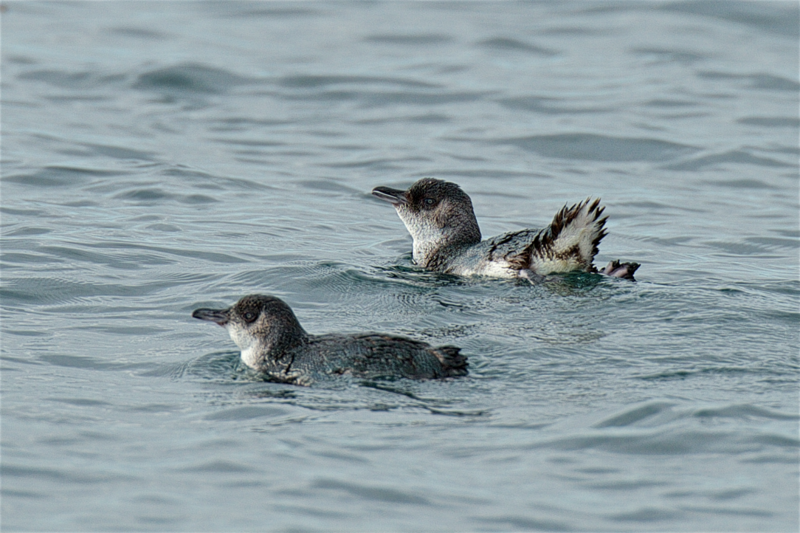 Rafts usually come ashore together and are comprised of the same individuals each night. 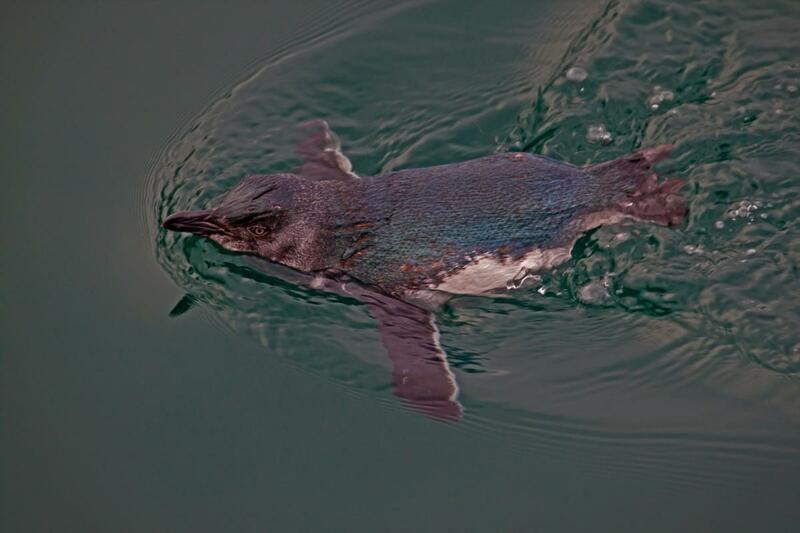 They feed at sea as solitary individuals or small groups, rarely more than 6 individuals. 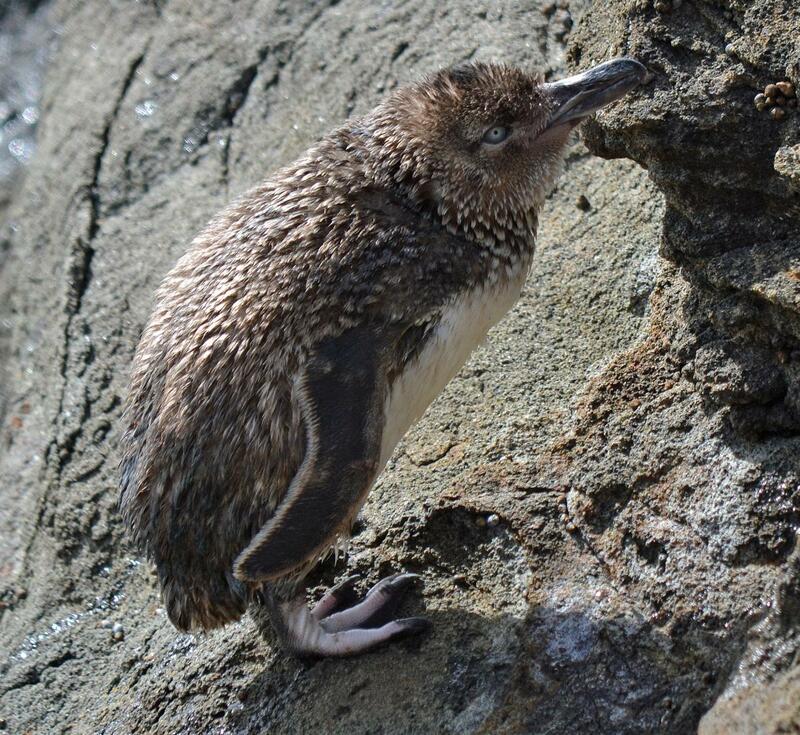 They must stay ashore continuously for about 2 weeks during the annual moult (mainly between January and March), when all feathers are replaced simultaneously. 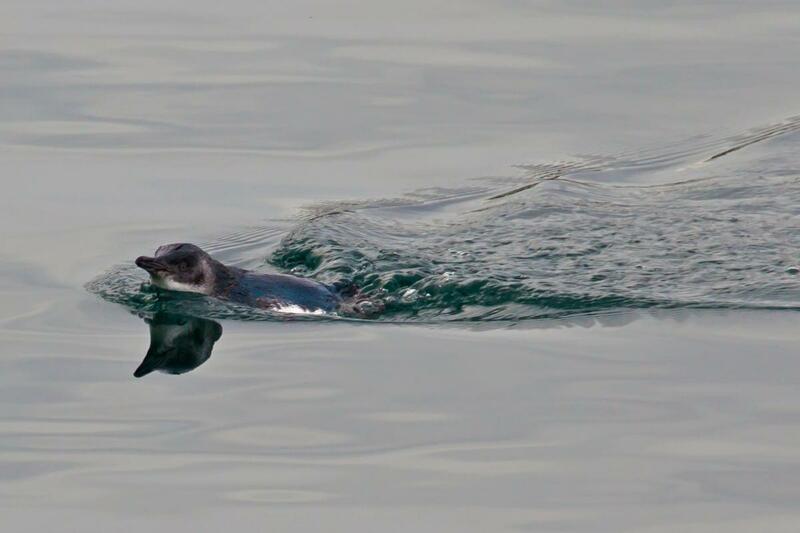 During the breeding season little penguins forage within 20 km of the colony, pursuit diving for prey generally in waters less than 50 m deep. 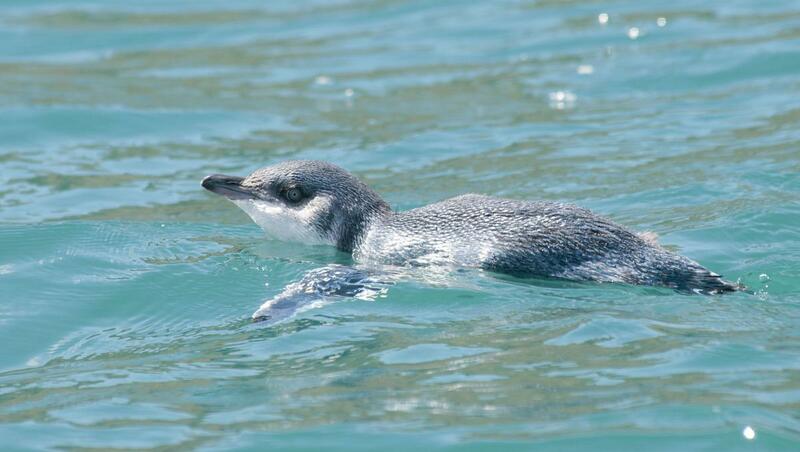 Their diet is composed of varying proportions of small shoaling fish, squid and crustacean species. 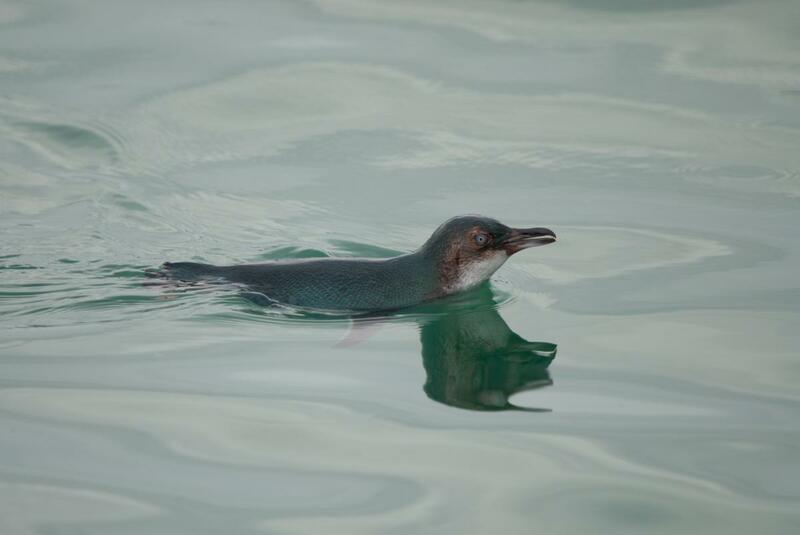 Important prey items include arrow squid (Nototodarus sloanii), slender sprat (Sprattus antipodum), Graham’s gudgeon (Grahamichthys radiata), red cod (Pseudophycis bachus), ahuru (Auchenoceros punctatus) and stomatopod larvae. Challies, C.N. 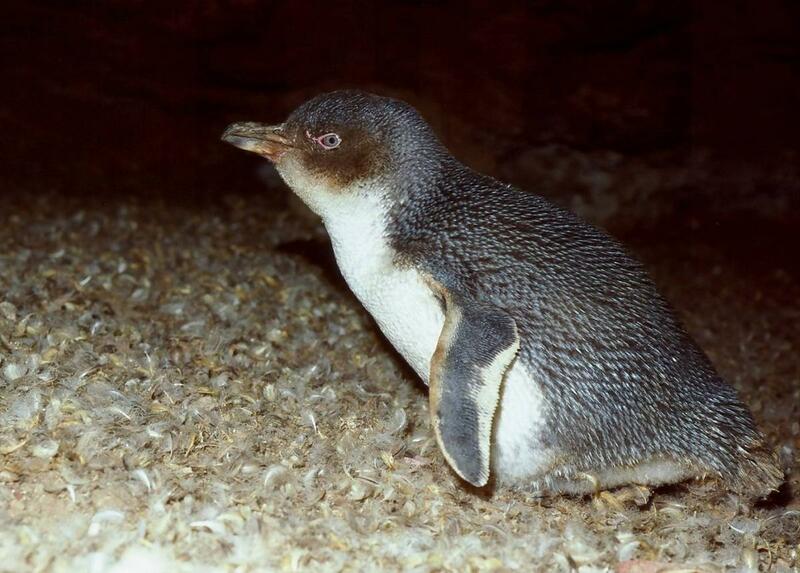 1998. 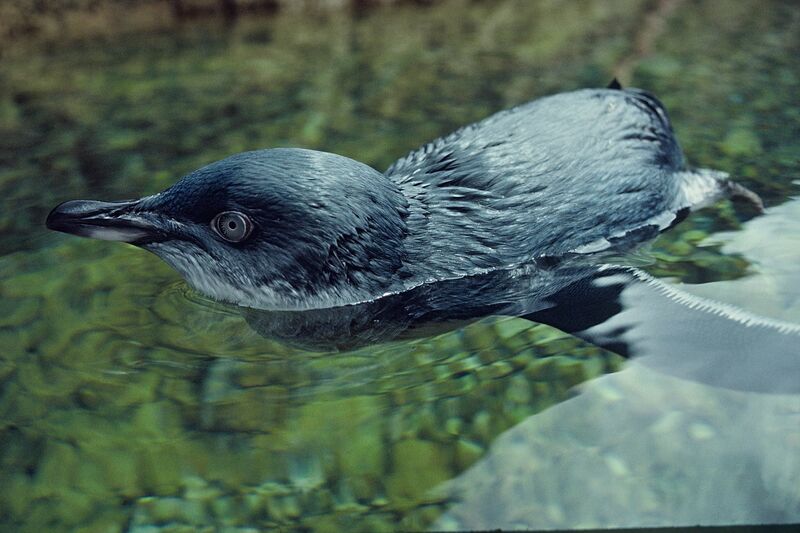 White-flippered penguin taxon data sheet. 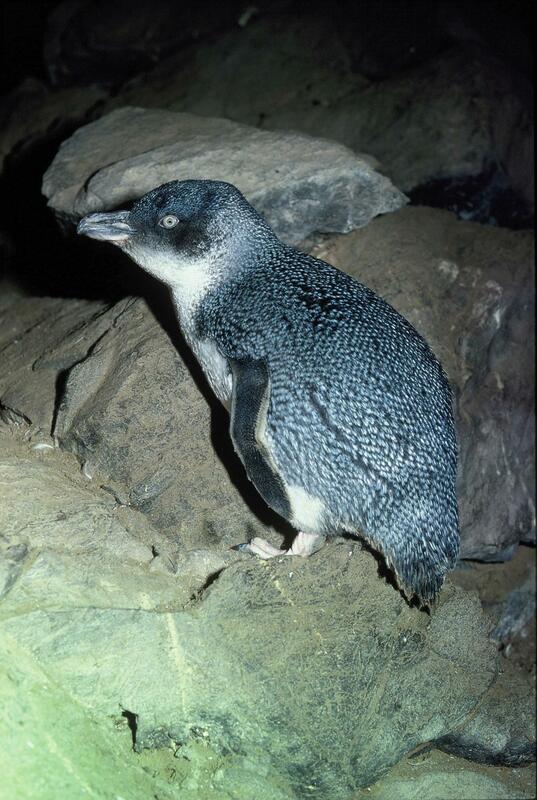 Pp 86-88 in Penguin conservation assessment & management plan, report 1998 (ed. 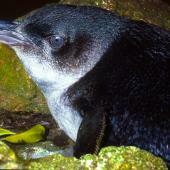 Ellis, S. et al. 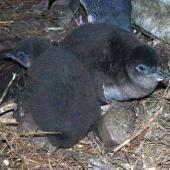 ), IUCN/SSC Conservation Breeding Specialist Group. Collins, M.; Cullen, J.M. ; Dann, P. 1999. 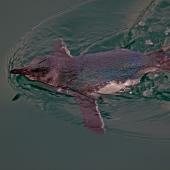 Seasonal and annual foraging movements of little penguins from Phillip Island, Victoria. 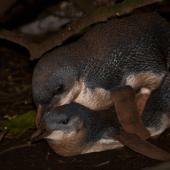 Wildlife Research 26: 705-721. 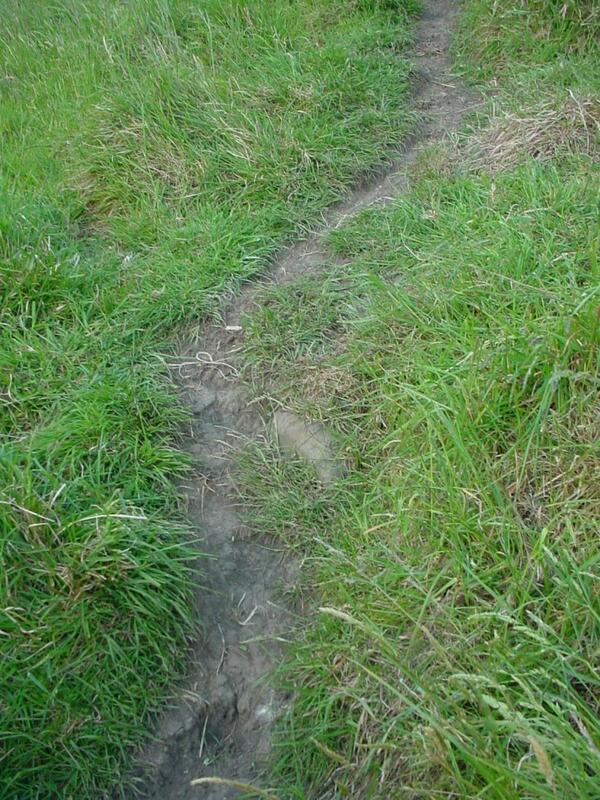 Flemming, S.A. 2012. 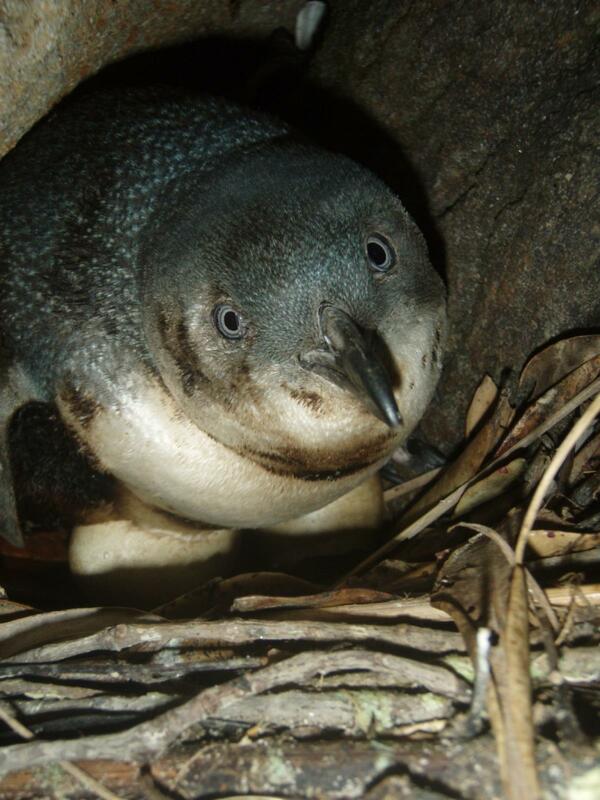 Little penguin (Eudyptula minor) diet composition at three colonies: can stable isotope analysis be used to detect dietary trends. 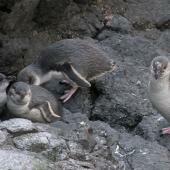 Unpublished MSc thesis, University of Otago, Dunedin. Heber, S.; Wilson, K-J. 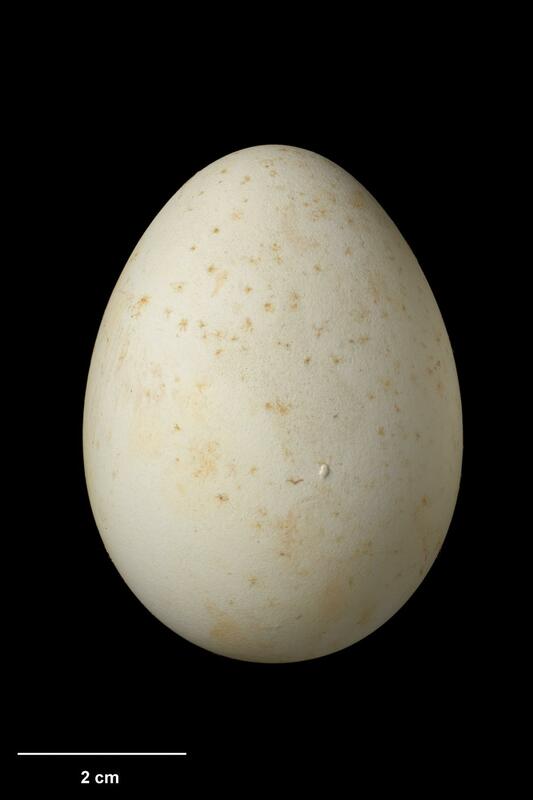 ; Molles, L. 2008. 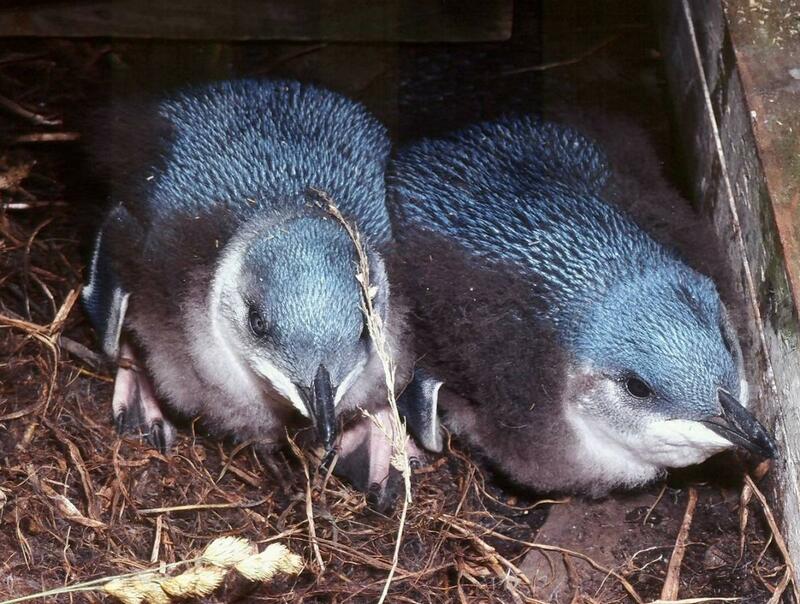 Breeding biology and breeding success of the blue penguin (Eudyptula minor) on the West Coast of New Zealand’s South Island. 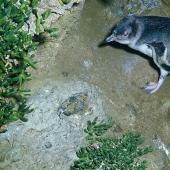 New Zealand Journal of Zoology 35: 63-71. 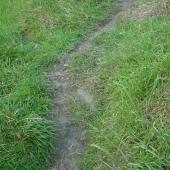 Marchant, S.; Higgins, P.J. (eds. ), 1990. 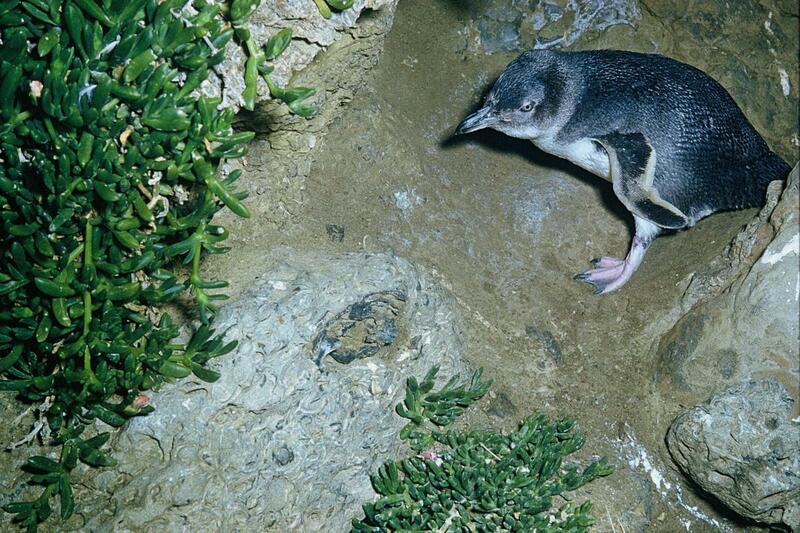 Handbook of Australian, New Zealand and Antarctic Birds. Vol. 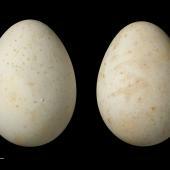 1, ratites to ducks, Melbourne, Oxford University Press. Tennyson, A.J.D. 2010. 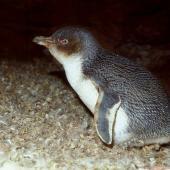 Sphenisciformes. 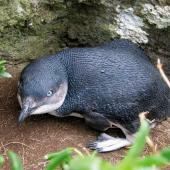 Pp. 52-63. 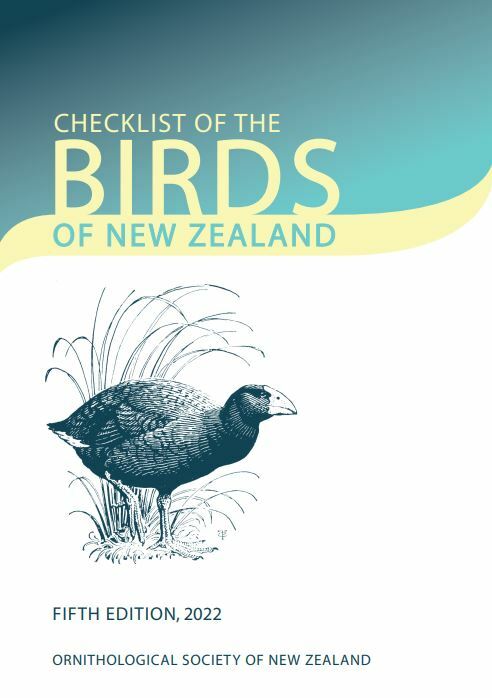 In: Checklist Committee (OSNZ) 2010. 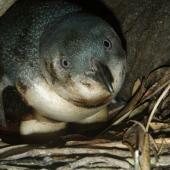 Checklist of the birds of New Zealand, Norfolk and Macquarie Islands, and the Ross Dependency, Antarctica (4th ed.). 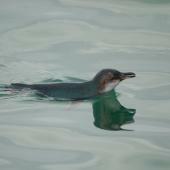 Ornithological Society of New Zealand & Te Papa Press, Wellington. 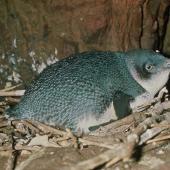 nest type varies considerably from small lined scrapes in caves and crevices or under logs and bushes to deep burrows. 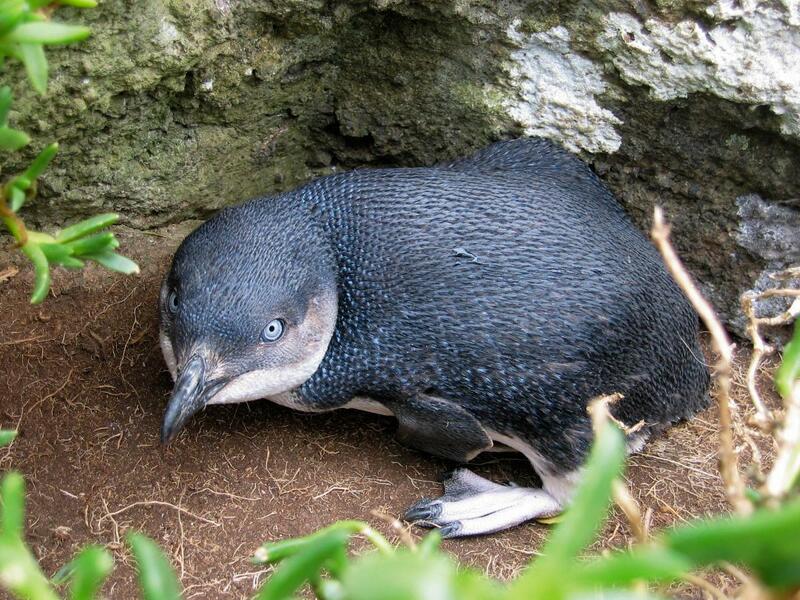 A small, stocky, dark blue and white penguin with a long, robust, dark hooked bill, blue-grey eyes, relatively short flipper-like wings, and pinkish-white legs and feet.